2 or more: $23.27 ea. If you want a stylish and efficient climate control solution for your home, choose the Honeywell CT50K1010 thermostat from Today's Concept. Along with the Honeywell CT50A4775, this model provides a great look that features a setting and thermometer scale on the face as well as a slide lever for making temperature adjustments. 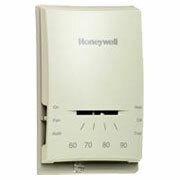 Find your Honeywell CT50K1010 thermostat at Today's Concept.